Stretch wrap is commonly made of linear low density polyethylene (LLDPE). It arrives at your dock in a fairly clean condition and if kept that way it has a real market value. Stretch wrap may well be the most valuable recyclable material in your warehouse/distribution center. 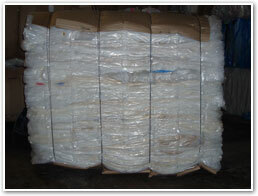 Stretch wrap is one of the largest components of a warehouse/distribution center’s waste stream. Those who don’t recycle it pay to have it hauled away. This could mean thousands of pounds of stretch wrap per year which translates into dollars saved or dollars spent. By removing stretch wrap from the waste stream, you will reduce the number of pulls therefore; saving money. First, there is the cost of hauling trash to the disposal site. This a fixed cost that you are aware of and can easily place in your formula for savings. We will help you design a collection and handling system. We will help you educate staff who will be involved in the program. We will help you implement a quality control program. Quality Control is important to successful program. It is desirable to contact your vendors to let them know that you have a successful recycling program and the important role they can play in its continued success. Ask them to keep tape and labels off the stretch wrap and not use tinted film. Collection containers for stretch wrap should be clearly labeled and conveniently located. Mark containers “Stretch Wrap Only”, containers marked for “Plastic only” will draw all kinds of plastic. Stretch wrap can be removed immediately in receiving or after pallets are moved and broken down. Containers should be located in receiving or in processing areas. A container should also be located in shipping and near the stretch wrapper. Here is you first opportunity to recover stretch wrap and is an important checkpoint. If stretch wrap is stripped from pallets in receiving, it should be immediately placed in collection containers. Stretch wrap is tacky and will pick up dirt and other contaminants if stored on the floor. Employees who are assembling outgoing pallets may be breaking down pallets loads and stripping stretch wrap. Since this may take place throughout your facility it is important to have collection containers distributed to those areas where most of this activity occurs. Your employees hold the key to the success of your stretch wrap recycling program. Make sure they understand the importance of their contribution. Underscore that tape and paper labels are serious contaminants and must be removed. Discourage the use of recycling containers as trash receptacles – especially among those employees not directly involved in the recycling program. Recognize that ongoing employee education and motivation will be essential to long-term success. The bottom line is that recycling must be seen as a firm-wide commitment – from the manager who recycles office paper to the warehouse employee who collects stretch wrap and bales corrugated. Recycling stretch wrap presents several opportunities. A well-run program can have hefty economic benefits. Diverting stretch wrap from landfills to the stream of commerce will save energy and preserves resources. You're Partnership with Compaction Plus Inc. Your partnership with Compaction Plus begins with the Plastic Audit Worksheet. Complete the worksheet and e-mail, fax or mail it to us. We will evaluate the data, schedule a visit and walk through with you or someone from your staff. Together we can then set up a program that is tailored to your facility and your circumstances. Compaction Plus can assist you with the program design. This service falls under the Consulting Services umbrella and all charges for this work will be billed accordingly.